Seven great events at local breweries and restaurants provide plenty of fun on tap this weekend, so please travel responsibly. Greater Grand Rapids unfortunately does not have Ireland’s celebrated Blarney Stone which, according to legend, endows kissers of the slab with the gift of the gab. We are blessed, however, with the opportunity to experience several exciting local events taking place today and this weekend to celebrate St. Patrick’s Day. 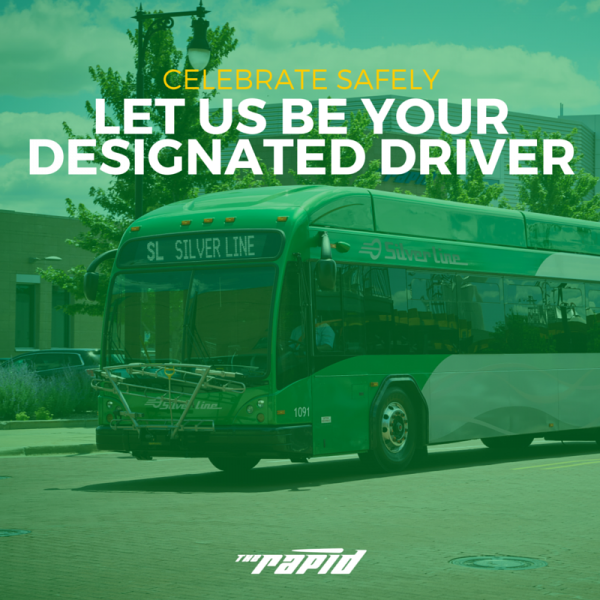 While you’re out and about, please travel responsibly – let The Rapid be your designated driver. There is no easier, safer and affordable way to get to where you want to go for St. Patrick’s Day events than riding a bus. Service on most routes is available until 12:15 a.m.. And if you’re out later than we are, don’t forget that there’s always Uber to get you home safely. 1. St. Patrick’s Day at The B.O.B. Ride with us to The B.O.B. on Monroe for a day full of festivities today. Starting at 2:00 p.m. there will be the Peanut Butter Porter bottle release, a selection of several craft beers and a great line-up of live music! There’s no cover charge for this event. Stop by One Trick Pony on Fulton today for traditional Irish fare, music, Guinness on draft and more! Grand Rapids natives The Willeys will even be playing a set. Get your green on with the American Legion Family today. They’re welcoming the public at the American Legion Northeastern Post #459 at 658 Michigan St NE for The Legion Green Party! Beginning at 12:00 p.m., stop by for slow-cooked beef and cabbage, $3.75 Guinness, Jameson and Bushmills. Karaoke will kick off at 4:00 p.m. and the Bimini brothers will perform at 8:30 p.m..
Seeking a unique musical experience this St. Patrick’s Day? Check out The Moxie Strings today across from Rapid Central Station at Founders Brewing Company. They’re set to play at 9:30 p.m. and you can expect an electric cello, 5-string violin, and more. Rapid routes nearby: Almost all routes lead to Founders. Michigan’s largest St. Patrick’s Day street party is back for another year of fun. This all day event begins bright and early at 7:00 a.m. on Saturday, March 19. Taking place on Ionia St., the street party will stretch from Oakes to Fulton and Weston to Commerce ending at 10: 00 p.m. Ticket prices range from $15-60. Don’t forget to purchase your tickets in advance! Make your way to Brewery Vivant on 925 Cherry St on St. Patrick’s Day. This is a brewery that champions living the Bon Vivant (good life) and today, they will take that to another level. Brewery Vivant will release its fifth annual Beer The Change Report, which unveils the company’s environmental, financial, and community sustainability for the previous year. To celebrate they will let guests participate in a Beer The Change challenge and receive a dollar off green beer all day. Find out how well this Brewery has met it’s annual goals while sharing a few drinks with friends. Are you looking for a great afternoon for the whole family today? Join Tori Loft, a dance instructor at the Grand Rapids Children’s Museum for a family dance party! From 5:30-7:30 p.m. this evening, Tori Loft will instruct a dance class for families with small children at The Children’s Museum of Grand Rapid’s found at 11 Sheldon Ave. Feel free to come decked out in your St. Patrick’s holiday gear. Have fun, be safe, and don’t forget to travel responsibly this St. Patrick’s Day! Where are you celebrating St. Patrick’s Day?